When my kids were younger they were not allowed to watch television. My husband and I would allow some PBS and educational videos and programming (Sesame Street, Mister Rodger's Neighborhood, Reading Rainbow, The Magic School Bus, Bill Nye the Science Guy and the one with the talking dog playing lead roles in classic books (am forgetting the name - but it was actually quite a lovely introduction to the classics - if any of you remember it, please leave it in the comments). 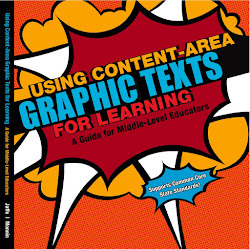 While I am writing a book about integrating graphic novels into the classroom (which I wholeheartedly support) until very recently I did not think they were fine examples of literature to be taken seriously. My son gave me I Kill Giants by Joe Kelly to read once I admitted to him that maybe I should look into graphic novels and take them seriously. I loved it, read some more and was seriously hooked into this literary format.There are some SUPER (educational -but don't tell them) graphic novels for kids and I will write more about it in my next blog - because I love them and because I am fresh from Comic Con. I am watching Kung Fu Panda as I write this (sad, but true - my adult daughter and I are getting ready to leave California). I just watched the scene where the Master learned how to teach the Panda to be the Dragon Warrior by using his affinities (love for food) and his strengths of character. It is a great lesson to us all! There are all kinds of minds around us and we need to learn to reach each one in his or her own way. It is my ONE YEAR Anniversary blogging. I was afraid to blog - even called myself a techno-dinosaur. I have, however, met wonderful friends, LOVE the comments left on my posts, and am reading such wonderful posts from others that I can't imagine not blogging now. Thank you all for your support and participation but PLEASE don't leave me any more awards. I probably wont accept them and hate to disappoint you. And thanks for your kind words, in spite of me inflicting the meme on you. Happy Blog Anniversary and also congrats for your award. You have a very interesting blog..
Brava (o) for the award! And, our anniversary! Happy one year blogging anniversary. You certainly deserve the award. Congratulations and have a productive time at your convention. Happy blog anniversary. I never would have believed that I would start blogging but I have enjoyed it. By the way, you mentioned no people on the street in the small town. It was actually raining off and on although you can't tell from the shots. Also it was after 5 or so and a lot of small towns don't have much going on downtown after the people that work there leave. Some of the more touristy or college towns in the mountains in this part of the country are very busy at night feeding the tourists and entertaining the college kids, but these particular towns I shot here have their tourist centers outside the downtown areas. In a way I kind of liked it because the character of the town is a lot less cutesy than some of the more touristy downtown areas in small mountain towns. It definitely reminded me of some mountain towns decades ago as opposed to the ones that are busy now which to me are starting to all look alike. Congrats to you! Well-deserved recognition. And congrats on your one-year anniversary. I agree, comments are the best! Congratulations! I totally relate to your 5 and 6. This past year I have met amazing people online and found some tremendous blogs, yours being one of them. I'm spotlighting you tomorrow (Thurs.) on my blog!! thanks for the well wishes! so far I am doing better than the first 2 injection sessions. So I am keeping a positive attitude!